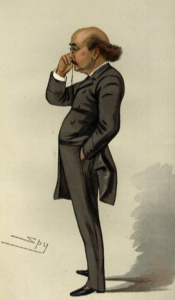 Boucicault, Dion[ysius Lardner] (1820?-1890) Irish playwright, actor and theatre manager was born on December 26th, the son of a French refugee and an Irish mother. He was named for his parent’s friend, Dr. Dionysius Lardner, who may have been his natural father, as he was known to take a paternal interest in and guardianship of the boy. 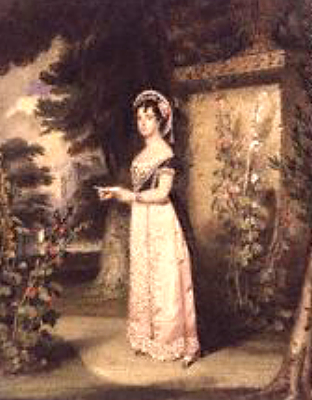 His mother Anne, was the sister of poet and playwright George Darly. His formal education began in Dublin, and continued in London after he moved there with Dr. Lardner in 1830. There he attended a boys’ grammar school called the College School of London University. He started acting and playwriting in 1836 under the pseudonym Lee Moreton. He would soon drop this name and, changing the spelling of his surname from Boursiquot, adopted the name he used thereafter. 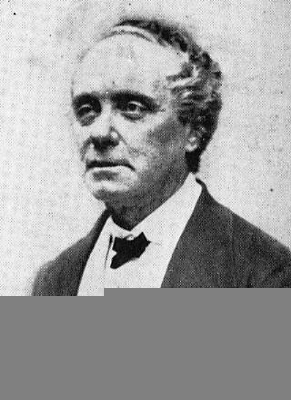 He acted in his own play A Legend of the Devil’s Dyke at the Theatre Royal in Brighton in 1838, and from this point on his life as a playwright and actor would be intertwined. Madame Eliza Vestris and Charles Mathews were the actor-manager team running Covent Garden Theatre, and through a lucky error occasioned by his stage name, Boucicault managed to get Matthews to read an unsolicited manuscript. With the editing and assistance of Mathews and Vestris, it became London Assurance. This brilliant five-act Regency-style comedy opened on March 4, 1841 at the Theatre Royal, London with the cast of Charles Mathews, William Farren, Mrs. Nesbitt and Madame Vestris and ran for sixty-nine performances. Its success brought Boucicault into youthful prominence, establishing him as "the cleverest, raciest, and most theatrically inventive playwright of his age." He rapidly followed this with a number of other plays among them the successful Old Heads and Young Hearts (1844) and a string of not so popular pieces including Used Up (1844) and Don Caesar de Bazan. But theatre managers found it cheaper and safer to produced English rewrites of successful French plays, and Benjamin Webster, the manager of the Haymarket Theatre, offered the young writer a chance to try his skills at adaptation. Finding himself in debt through extravagance and generosity (his mother and brother had moved to London to cash in on the playwright’s success), Boucicault accepted and went to Paris in December 1844. 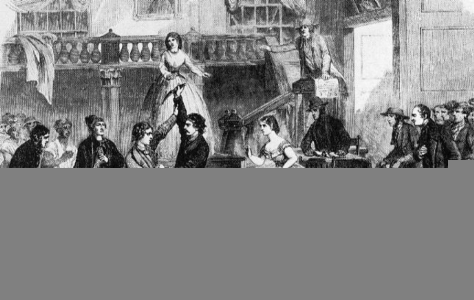 On July 9, 1845 he married Anne Guiot, a French widow with income and property. Less then three years later she died in a mysterious fall while the couple was vacationing in the Swiss Alps. Despite the consequent inheritance, Boucicault found himself once again in debt and returned to England. Ben Webster, now manager of the Adelphi, presented Boucicault’s The Willow Copse in 1849. He was then engaged by Charles Kean, the new lessee of the Princess Theatre, to provide popular melodrama to balance Kean’s Shakespearean revivals. Mostly on the strength of intelligent plagiarism from the scripts he had seen in France, he supplied Kean with his "cape and sword" plays The Corsican Brothers, Louis XI and The Vampire (1852) in which Dion made his sensational London acting debut in the title role. His leading lady in The Vampire was Kean’s nineteen year old adopted daughter Agnes Robertson. 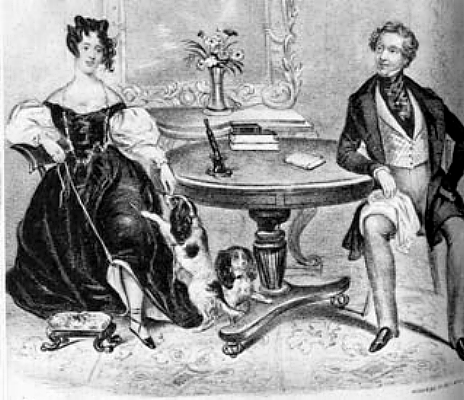 When Agnes moved in with Boucicault the following year and a scandal ensued, Kean ended his contract with the playwright. 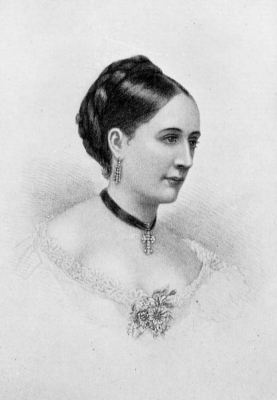 In 1853 Boucicault borrowed the money for two fares to New York City from Ben Webster, and it was as Agnes Robertson’s husband and manager that he began his career in the American theatre. 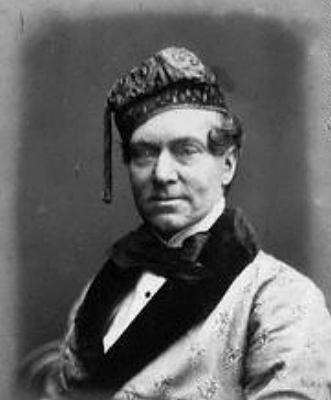 He made his American acting debut in Boston in 1854 and two months afterwards gave his first New York performance as Sir Charles Coldstream in his play Used Up. After touring the United States with Agnes, and managing theatres in New Orleans (1855), Washington (1858) and New York (1859), he got a feel for the taste of the American audience. It was as he stated "the actual, the contemporaneous, and the photographic." Between 1857 and his return to England in 1860, he reached his maturity as a writer. The Poor of New York (1857) adapted from the French, tells how an unscrupulous banker deprives a man and his family of their fortune. It established the vogue of the ‘sensational scene’ in melodrama, in this case, the rescue from a burning building. Jessie Brown; or, The Relief of Lucknow (1858) centered on an Indian uprising. The Octoroon (1859) examined the extremely hot issue of slavery and racial prejudices with its burning ship and slave auction scene. It contains perhaps the best example of the contemporaneous nature of these plays, in which a camera (new technology at the time) is figured as a major plot device in capturing the villain. Dot (1859) starred comedian Joseph Jefferson as Caleb Plummer, his first serious role. In 1860, Boucicault and Agnes made their brilliant London comeback in the first of his Irish melodramas The Colleen Bawn. Featuring an underwater rescue, the play had a record run of two hundred seventy-eight performances. "Sensation is what the audience wants and you cannot give them too much of it." It was also with the The Colleen Bawn, that Boucicault made an historical theatrical first. He presented the script to Benjamin Webster under the terms that he would take a risk by sharing in the profits instead of receiving a down payment for the manuscript. 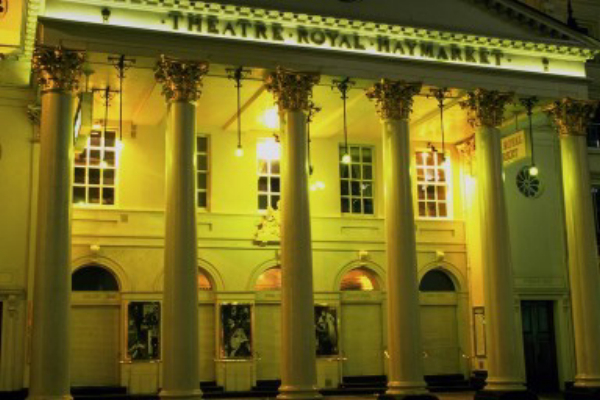 The huge success of The Colleen Bawn provided the couple with enough money to take over the lease of the Drury Lane Theatre in 1862, and to begin refurbishing Astley’s Amphitheatre as The Theatre Royal, Westminster. 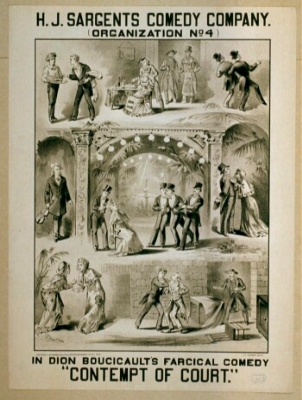 The Boucicaults remained in London until 1872 and the outstanding successes of this period include an adaptation of Rip Van Winkle (1865) for Joseph Jefferson, a horse-racing melodrama The Flying Scud (1866), and a scandalizing courtesan-play Formosa (1869). 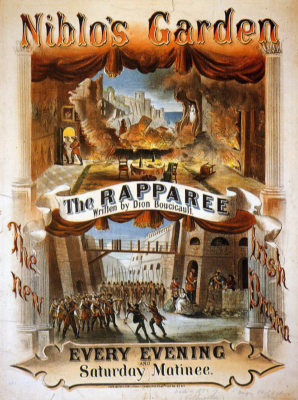 A second Irish melodrama Arrah-na-Pogue (1864, Princess Theatre) in which he played the part of a Wicklow carman, was followed ten years later by a third and the best of the genre The Shaughraun (1874, Drury Lane Theatre) in which he invites the audience to take sides with the impoverished but noble-minded Irish aristocracy and their devil-may-care peasantry, against an unprincipled squireen who dares to aspire to a lady’s hand. It was his performance as the roguish Con that won him the reputation of being the best stage Irishman of his time. 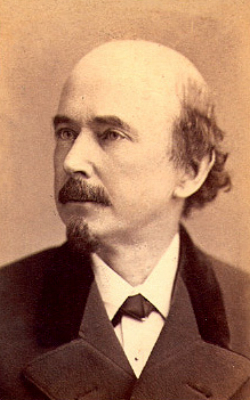 In 1875 Boucicault returned to New York and finally made his home there, where he continued to demonstrate his mastery of the comic and sensational elements of melodrama in Robert Emmet (1884). But of the several plays that he produced in the six remaining years of his life, only The Jilt (1885) did anything to sustain his reputation. His personal reputation was seriously hurt when he repudiated his marriage to Agnes Robertson, and bigamously eloped to Australia with Louise Thorndyke, an American actress 44 years his junior. Agnes won overwhelming sympathy and insisted on retaining her married name, although her children had technically become illegitimate. Boucicault claimed until his death that his common-law wedding to Agnes Robertson was not legally binding. He occasionally paid visits to London where his last appearance was in The Jilt in 1886. Boucicault spent much of his last years teaching at a drama school established by producer A.M. Palmer and serving as his play doctor. He died in the arms of his wife Louise in New York on September 18, 1890. Of his five children, Dion, Aubrey and Nina, also became distinguished in the profession. Over his career, the wittiest dramatist between Sheridan and Wilde produced over 200 plays. But with the rise of realism and the emergence of Ibsen and G.B. Shaw, his work eventually fell out of fashion. He was however to have an influence on O’Casey who praise his ‘color and stir’. He was as much admired for his own extravagant and idiosyncratic style of acting as he was for his writing. And in the long run, his successful struggle to secure passage of the Copyright Law of 1856, his development of fire-proof scenery, his securing a profit-sharing system for playwrights which led to their receiving royalities, and the establishment of a foundation for actor-training, may have been as important to the development of American drama as his writing. Joe first acted with Dion Boucicault in Cleveland when in October of 1877, he played Robert Ffolliot in Boucicault’s The Shaughran, with the author himself playing the leading role of Conn. Between 1879 and 1882, Joe repeated the role in support of Boucicault at the Boston Museum, and also acted the parts of Michael O’Dowd Jr. in Daddy O’Dowd, Hardess Cregan in The Colleen Bawn, and Beamish McCoul in Arrah-Na-Pogue, among others. 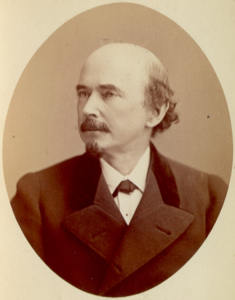 Shortly after McCullough’s retirement in the fall of 1884, Joe was engaged by Boucicault to appear in St. Louis in the title role of his new play Robert Emmet. If the play proved a success Joe would continue in the role until Boston, New York, and Philadelphia had been visited. But as rehearsals progressed, Boucicault knew the play was weak, and decided to by pass the largely French audience in St. Louis for a more sympathetic Irish crowd in Chicago, but it didn’t help. The play was a failure and Boucicault decided to drop it. Boucicault replaced it with The Shaughran and engaged Joe to play Captain Molineux, a strong leading role. Joe accepted, but balked at playing Arrah Na Ponge and Colleen Bawn. When the troupe arrived in Buffalo in December 1884, Joe reported for his performance of The Shaughran, and was told his services were no longer needed. On the advice of his attorney, Joe reported for his performance each night through engagements in Buffalo, Syracuse, and Rochester, and every time Boucicault sent him away. When contacted by the press, Boucicault stated: "There is no trouble between me and Mr. Haworth. He has been paying for a salary and I discharged him as I would any other servant. He had no contract at all; but that was not necessary; an understanding with me is as good as a contract, but there was no understanding, it was a misunderstanding. He refused to play in Arrah Na Pogne and Colleen Bawn and I filled his place." Haworth had a summons and complaint served on Boucicault, suing him for breech of contract. "If you had been cast for Hamlet, would you have played it?" "What," replied the young tragedian; "play Hamlet with an Irish company!" "Well suppose Mr. Boucicault had asked you to play Icillius, would you have consented?" "Not to Mr. Boucicault’s Virginius, I thank you." The attorney for Bouciault tried every means to upset Joe’s evidence, but failed, and the judge awarded Haworth a verdict for his claim in full and costs. Then Bouciault’s attorney offered to compromise the suit or it would be brought to a higher court on appeal. As the offer was a solid one and his costs would be paid, Joe concluded to take it and save his time, although he did so against his lawyer’s advice. Joe had vindicated himself and felt satisfied. Subsequently, Boucicault never spoke ill of Joe, and often praised his work in Robert Emmet, saying the play’s failure had nothing to do with Joe’s excellent work in it.